Casanova Las Vegas is an authentic Italian restaurant in The Venetian’s Grand Canal Shoppes. Casanova is an authentic, intimate, and unpretentious Las Vegas Italian restaurant inspired by the Trattorias of the Mediterranean coast. Located in The Venetian’s Grand Canal Shoppes, with views of the Gondolas that float in and out of the giant shopping center, the restaurant is a casually inviting dining experience with a menu created by Venice native Chef Daniel Dotti. The warm and friendly restaurant features traditional dishes made with the fresh ingredients popular in the Venice, Greece, and the Middle East, with a special emphasis on fish caught fresh from the Mediterranean Sea. Specialty appetizers include Swordfish Carpaccio, Burrata with arugula, Lentil Soup, Greek Salad, and a Hummus platter featuring a trio of options served with fresh pita bread. 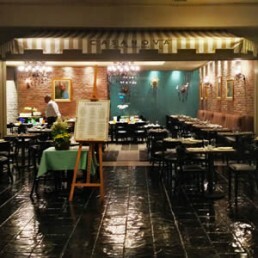 Casanova also serves pastas like Fettuccine with Meat Sauce, Shrimp Ravioli, Risotto Beef Tenderloin, and Greek style Penne, as well a selection of red and white Pizzas. Entrees include Cajun Shrimp skewers, Lamb Chops, Eggplant mussaka, Beef or Chicken shish kabaobs, sauteed Mediterranean mussels, Herb crusted Salmon, and Mediterranean Baked Sea Bass. Authentic desserts include Filo dough cheesecake, Tiramisu, and Profiteroles. The restaurant also features a well-curated wine list, featuring affordable bottles or reds and whites served by the glass, as well as a selection of domestic and imported beers. Casanova is a romantic spot for a date night, but also the perfect Las Vegas restaurant to enjoy with the whole family because it boasts a kid’s menu that will make even the pickiest young diners happy. The restaurant also offers a full breakfast menu with highlights that include fresh French Toast, Greek Omelettes, and Crepes that can be prepared in sweet or savory styles. Casanova is an intimate yet casual restaurant with a view featuring an authentically Mediterranean menu and an atmosphere that evokes the relaxed and charming Trattorias that line the Italian and Greek coasts.